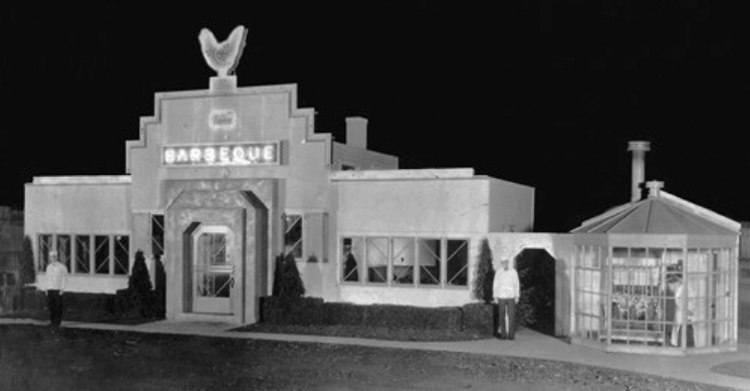 In 1946, as Jimmy Oreck was about to reopen his popular Flame restaurant at the foot of Fifth Avenue West on the harbor, the Duluth Herald ran a series of articles on the business, announcing that what began as a humble barbecue stand had evolved into the “Northwest’s most spectacular night club.” Not bad for a kid who left school after the eighth grade to sell newspapers and shine shoes. The Flame’s history goes back to the Great Depression, when in 1931 Jimmy Oreck and Alex Zurovsky opened a barbecue stand on the southeast corner of Fourteenth Avenue East and London Road. A year later Zurovsky dropped his end of the bargain, leaving Oreck and his wife Ruth to run the stand. The building could hold only thirty patrons, who were lured in by the glassed-in rotisserie Oreck installed next to the entrance, showing long, revolving strips of ribs and, according to the Herald, “whole chickens toasting to a golden brown over charcoal flames.” Mouthwatering. As the spinning meat attracted more and more customers, Oreck added wings to the original shack, including a bar when Prohibition was repealed. 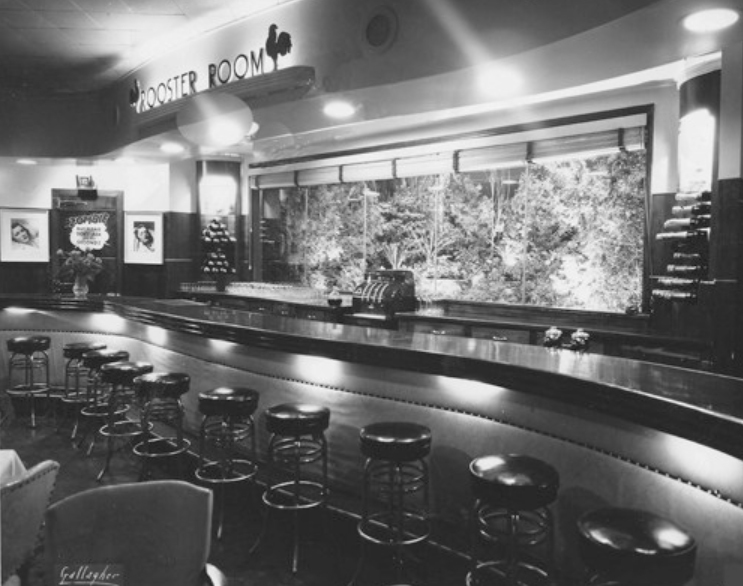 By 1936 they had outgrown all the expansions, and the next year Oreck added on again (including a cocktail lounge called the Rooster Room) and at the same time modernized the older buildings and tied them together visually with an Art-Deco façade. At the same time, Oreck and manager Charlie Kassmit pulled out all the stops to add experience-enhancing gimmicks. The remodeled Flame building boasted large picture windows that looked out over a garden of “trees and shrubs, a waterfall, trout pool, and stuffed wild animals.” It also held the town’s first custom-made semi-circular booths, strolling musicians, a cigarette girl, and a dwarf doorman decked out in a red uniform. 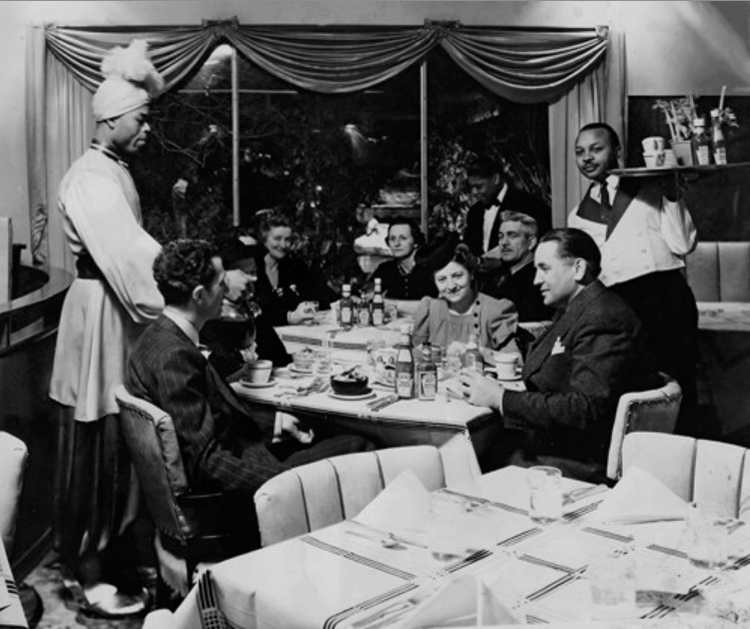 Coffee was served by “The Sultan of the Second Cup,” a man wearing a turban and curl-toed shoes. They put in a much larger glassed-in rotisserie, and it wasn’t just the meat and the drinks the patrons came for—the Flame became famous for its pop-overs, made fresh daily by Ruth herself. In fact, the food was especially good. Duncan Hines stopped by the Flame in 1940, and the next edition of his Adventures in Good Eating contained a review of the restaurant, and the food writer spent much of his review praising the Lake Superior whitefish, chicken, steak, lobster, and “piquant” ribs. When fire claimed the Flame in 1942, Oreck temporarily moved the restaurant to 110 West Superior Street. Meanwhile, he purchased a grocery warehouse along the harbor. The three-story fire proof building—designed in 1912 by renown Duluth architect Frederick German—originally housed the Duluth Marine Supply Company, a grocery retail firm specializing in selling foods to Lake Superior vessels. 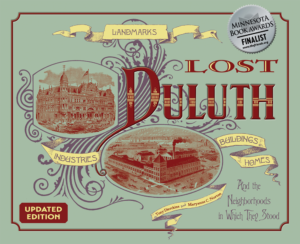 By 1936 Duluth Marine Supply had moved; the building remained a grocery warehouse until Oreck bought it and hired architect Harold St. Clair Starin to convert it into The Flame. The Duluth Herald called the new Flame “elaborate…dazzling…sensational…[and] out of this world.” It sat four hundred diners with room for another 100 patrons in the lounge. Its semicircular black terrazzo dance floor was framed with “inverted Roman-like columns flooded with multicolored lights.” The restaurant and nightclub included a glass stair tower and many windows that looked out over the harbor, including five twelve-foot windows in the dining room that created a “wall of glass.” Patrons could watch ore boats and freighters come and go; the vessels’ names were announced over the building’s p.a. system as they passed the restaurant. But Oreck wasn’t happy with the building because of compromises made during construction due to war-related shortages. In 1955 he moved the business to Superior Street, reworked the old Flame, and by 1956 was back at the Fifth Avenue building along the “seaway,” as the restauranteur called the waterfront. The building was tweaked inside and out, with the addition of a piano bar, more windows, and a flame-red paint job on the exterior. In the 1960s and 70s the restaurant operated an excursion boat, the S. S. Flame, which offered harbor cruises. In 1970 the Flame and its counterpart, the Flamingo, accounted for 35 percent of all the time Duluth’s aerial lift bridge had to lift to allow traffic through the ship canal. This prompted complaints from Park Point residents, and they made the first of many attempts to establish lifting restrictions. Bridge operators didn’t fight the restriction attempts; according to lift bridge supervisor Bob Brown, all those lifts for pleasure craft were prematurely wearing out the bridge’s batteries. As Duluth attracted more family visitors, expensive restaurants like the Flame struggled, and the eatery closed periodically. When it reopened in 1967, it had a less-expensive menu and a new name: Harbor Lights. Oreck sold the business to a Memphis developer in 1971 and retired; the restaurant closed in 1973. The Anchor Inn rented the building until 1982; Oreck died that same year at age 82. In 1983 Micky Paulucci of Grandma’s Restaurants reopened the Flame in its Fifth Avenue location, but it closed just eighteen months later. The building was home to the Lake Superior Center from 1990 until 1996. It was demolished in 1998 to make room for the Great Lakes Aquarium. Mayor Gary Doty, a supporter of the aquarium, proudly took the first swing with the wrecking ball.